Srinagar, Feb 26: Scores of villagers were treated and provided free medicines at a medical camp organized by Army in Ladakh region. Defence Ministry spokesperson Colonel Rajesh Kalia told UNI that under the aegis of Fire and Fury Corps, a Medical and Health Awareness Camp was conducted by Parashu Brigade as part of Sadbhavana at Nimu in Ladakh region. “A large number of villagers, including elderly, women and children, were benefited by the Camp. 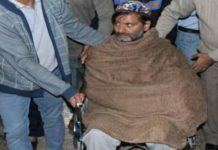 A survey was carried out to reach out to the locals and understand prevailing general ailments and accordingly medicines were procured for the Camp,” he said. Col Kalia said a team of four doctors, including a Lady Doctor and a Dental Specialist, offered their services and rendered expert medical advice to villagers and also the Next of Kin of soldiers as part of the “Year of the Next of Kin”. “Medicines pertaining to variety of ailments were prescribed and distributed as advised by the Doctors,” he said. Meanwhile, the Commander Parashu Brigade addressed the villagers and appreciated their active and volunteer support to the Indian Army. He also brought out the pivotal role played by the Indian Army in Nation Building. The Commander assured the locals of all possible help by the Fire and Fury Corps. “The Medical and Health Awareness Camp organised by Parashu Brigade is part of the ongoing efforts by the Indian Army, to further strengthen the bonhomie and goodwill with people of Ladakh,” Col Kalia said.